Great Experience from the time I first talk to Capt. 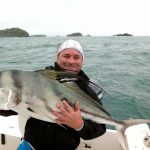 Kerry by email, about 4 weeks before our fishing experience, it was a great experience. We coordinated our trip during for the week we were in Panama. We traveled from Playa Las Lajas (1 hour away), we planned to be there for 7am but didn’t make it until 8am or so. As we didn’t follow his directions. We got out to the water in no time. Our first experience was catching sardines in a bay. Oddly, the sardines (bait) was bigger than the fish we catch at home.After catching the bait, we went to a fishing hole. We caught our first 4 fish ( Mullet Snappers ) in the first 1-2 hours. 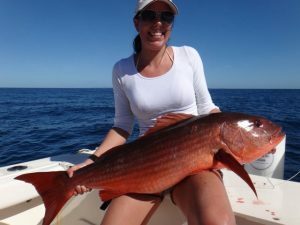 As we were not getting any more bites, we moved to another fishing whole where we caught 2 more snapper in no time. We packed some sandwiches, veggies, water and cerveza for the day. With the cooler we brought, and the cooler that was provided, we all brought food home. In the afternoon, we moved to the big water. We had some fiesty ones… We caught 3 jacks. They gave us a fight reeling them in. In the end, we caught 9 fish. First mate Michael fillet them for us before we left the marina. We had 24, very large filets. We took home enough fish to feed 10 people for dinner and left the rest for friends in Playa Las Lajas. Capt. 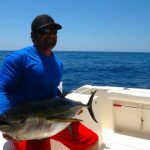 Jose and first mate Michael were very attentive to us and recognized when we had no bait. With my Father turning 78 (26-Feb), they gauged both him & us girls well. They netted the fish or reeled them in if we asked. Looking back at my first communication with Capt. Kerry, we said we had no expectations of type of fish we caught. We like recreational fishing. Based on the ratings I read, I would suspect your expectations were not communicated. Great experience…Would do it again!! !